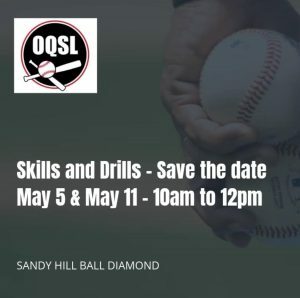 The 2019 OQSL Skills and Drills will be offered over 2 weekends in May for new players and existing players without an OQSL ranking. The objectives of the Skills and Drills events are to give new players an opportunity to meet OQSL Team Captains, dust off and practice their softball skills, achieve a ranking for the OQSL Team Draft, and to meet each other! Skills and Drills #1 – May 5, 2019, 10:00am to 12:00pm. Sandy Hill Arena Baseball Diamond. Skills and Drills #2 – May 11, 2019, 10:00am to 12:00pm. Sandy Hill Arena Baseball Diamond. At a minimum, we recommend you wear comfortable athletic wear and closed toe running shoes. This may include: shorts, t-shirts, long sleeved t-shirts, sweat pants, softball/baseball cleats, softball/baseball pants, and maybe a ball cap (note: metal softball/baseball cleats are not permitted in OQSL activities). You will need your own softball or baseball glove. The league will supply softball bats and balls. It’s important to stay hydrated and to replenish your energy so be sure to bring a water bottle and a snack. New player? Existing player without a ranking? Make sure you RSVP for your OQSL Skills & Drills date.